I was intrigued by reports that baby Prince George's new nanny had trained at the prestigious Norland College. A college for nannies? Why, yes: Norland College in Bath offers a BA (Hons) in Early Years Development and Learning along with the "Norland Diploma," a hallmark of quality (from the website). In addition to childcare and nanny training, Norland nannies are now taught martial arts and advanced driving skills (to help them avoid kidnappers, paparazzi, and skidding on the ice). Those are Norland nannies in uniform; they wear it during training (although graduates are no longer required to wear the uniform at work, unless the family wants them to). The uniform itself was recently redesigned: it's a bit more 1950s chic now. Speaking of the 1950s, it seems as if there should be a series of girls' school stories set at Norland (or somewhere like it). I would read it! Would you like to recommend a nanny? I'll add her (or him) to my list! Milly and I would like to recommend for your viewing pleasure Miss Minoes (2001), a Dutch film based on the children's book Minoes by Annie M.G. Schmidt (published in the United States as Minnie; Milkweed Editions, 1994). I love the premise--a cat turns into a young woman, instead of the other way around as so often happens in fantasy books. And I love Miss Minoes's green fur-lined coat. But back to the premise. It's a fun one for cat-lovers in particular, as Miss Minoes retains a lot of her feline qualities: she climbs trees, rubs noses, hides under the table, sleeps in a box. She purrs even! There's a plot, too (it involves a shy newspaper reporter), but it's the cat-as-young-woman part that makes me want to track down the book, which is bound to be better than the movie. And to ask about other children's books featuring animals that turn into people (not just anthropomorphic animals, which are a dime a dozen). I know there must be lots. Not the finger puppet that counsels students at McQuarrie Middle School (although you could do worse than follow his advice), but the audio of Tom Angleberger's The Strange Case of Origami Yoda (Recorded Books, 2011; Amulet, 2010). 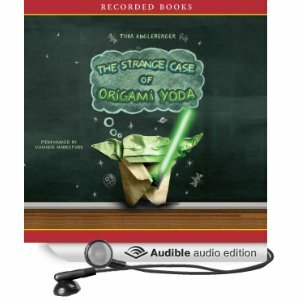 We listened to Origami Yoda (and its sequel, Darth Paper Strikes Back, which is even better) while on vacation last week and highly recommend it to everyone who loves Star Wars and has ever been (or will ever be) in middle school. Origami Yoda has some of our favorite audio features--namely multiple narrators, only one of which we didn't like, and an episodic plot (we were mostly making short trips in the car). Bonus: it's funny. And for a couple of hours, the kids only argued over who got to read The Secret of the Fortune Wookiee first when we got home (I won).